On my days off I've been searching the charity shops for some home kitchenware and bathroom accessories. To no avail, I haven't found anything of interest I have a particular look in mind I'm after something with a damask pattern, or a gothic easthetic Ive searched everywhere possible. I've found these jar. However, they 're from the states, and one jar is £9 and calculating the cost of three jars along with international shipping it's going to be £42 or nearly $60. Despite how gorgeous they are, I simply can't justify that price. 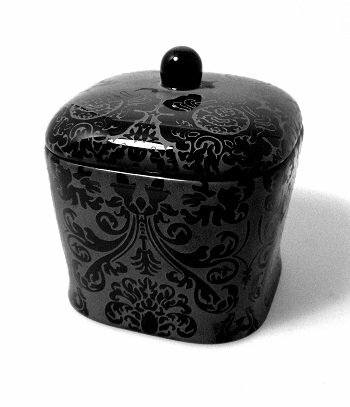 I am getting to the point where I may buy some cheap black jars and stencil a damask pattern. However, during my day off I managed to find a damask tray to place the canister. I bought the tray for seventy-five pence I could use. 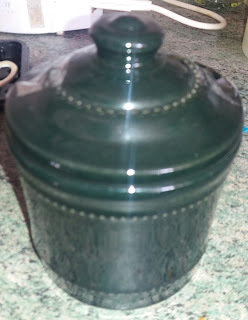 I also found this jar for £1 sadley there was only one jar if there had been another two I would used these as cannisters. For bathroom I've been looking for black accessories with damask motif again, I haven't found anything to match. I did find this plastic one with a plastic crystal cut at the bottom. But for the price for two sets I'm going to pay £17 a game and I need two sets I'm going to pay £36 for two items. While researching, I came across Asda a supermarket chain in the U.K but owned by Walmart. 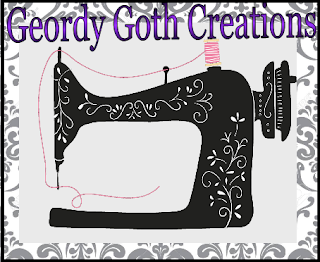 It's changed the colour scheme to grey and purple I was originally planning for a black and white scheme. 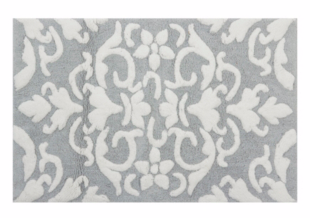 I found some excellent damask accessories incorporating damask patterns and complementary bathroom mat. 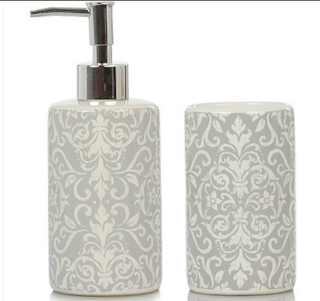 The set are much cheaper and look better quality. Very nice items! Argh I hate when you buy things from overseas and have to pay a lot more! Exchange rate is painful! Thanks, I wish I could of find more the jar, it's so annoying I haven't found anything with a damask pattern but a couple of years ago they were easy to obtain it's the annoying part of fashion GRRR. I wouldn't mind but the sterling still reasonable strong to other currencies, however it the price of international shipping, GGRRR grumbles lol. 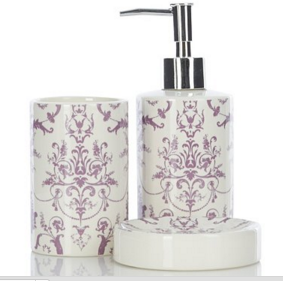 Its so annoying as the states have such wonderful stuff but once you pay for the item the P&P is just as expensive as the item or more at times.